Did you know that you can now watch every race in the U.K. and Ireland via the free Paddy Power app? 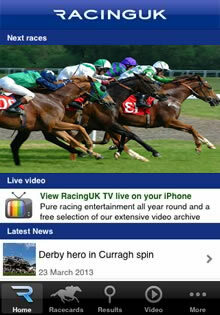 Paddy Power have teamed up with Racing U.K. & At The Races to bring live racing to every iPhone, iPad & Android.. Racing U.K. are a subscription horse racing channel that broadcasts live racing from the following 33 racecourses in the United Kingdom - Aintree, Ayr, Bangor, Beverley, Carlisle, Cartmel, Catterick Bridge, Cheltenham, Chester, Epsom Downs, Exeter, Goodwood, Hamilton Park, Haydock Park, Huntingdon, Kelso, Kempton Park, Ludlow, Market Rasen, Musselburgh, Newbury, Newmarket, Nottingham, Perth, Pontefract, Redcar, Salisbury, Sandown Park, Thirsk, Warwick, Wetherby, Wincanton and York. To watch a live stream of racing on either your iPhone or Android you can either place a £1 bet on that particular race or take out a subscription with Racing U.K to enable you to watch every race from all 33 racetracks. Subscriptions - iPhone £14.99 /Android £9.99 Monthly. 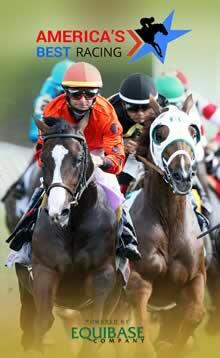 Horse Races Now is a free app for both iOS and Android that streams live racing from the following 33 racetracks in the United States - Keeneland, Ajax Downs, Aqueduct Racetrack, Assiniboia Downs, Belmont Park Racetrack, Beulah Park, Canterbury Park, Charles Town, Colonial Downs, Delaware Park, Delta Downs, Ellis Park, Emerald Downs, Evangeline Downs, Finger Lakes, Hastings Park, Hollywood Park, Horsemen's Park, Indiana Downs, Kentucky Downs, Lincoln Race Course, Lone Star Park, Louisiana Downs, Northlands Park, Penn National, Remington Park, Ruidoso Downs, Sam Houston Race Park, Saratoga Race Course, Tampa Bay Downs, Turfway Park, Will Rogers Downs and Zia Park. Besides live streams and commentary, you can also watch replays instantly or trawl through the archives which go back 2 years. The app also uses push notifications to alert you when a race is about to start featuring one of your favourite horses, jockeys or trainers. Paddy Power streams more live horse racing to their mobile app than any other bookmaker. Not only can you watch horse racing from the United Kingdom and Ireland, but you can now also watch racing from every racetrack in South America, South Africa and Dubai. To access a live stream, all you need to do is place a qualifying bet of £1/€1 or more on a particular race. Paddy Power Mobile has a very strong focus on horse racing. 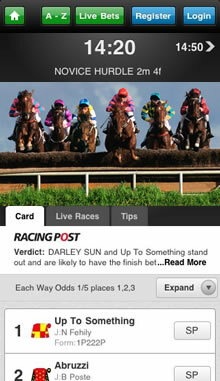 Their app offers extensive racecards, with information on jockeys, trainers, weights, owners' silks & form figures. They also provides independent betting advice from the Racing Post's tipping experts, while their Quick Bet option allows users to quickly wager on the betting pros selections. While the "America's Best Racing" app doesn't live stream horse racing from the United States, it does offer video replays of every graded stakes race in the United States. The America's Best Racing app is a joint enterprise between the Equibase Company and The Jockey Club. It is free to use and available on iPhone, iPad and Android devices, such as the HTC One (M8), Sony Xperia Z1 and Samsung Galaxy Trend. Replay videos are available to watch immediately after each race has been run. The archive also features an archive of every US race dating back as far as 2010. Finding an individual race to watch is easy thanks to the apps advanced search capabilities that let you filter races by jockey, horse, racetrack, trainer and races. 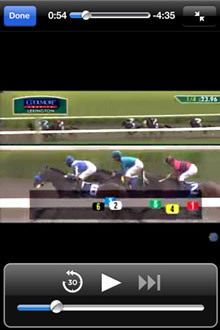 Each video is accompanied by a results chart that gives details on each horse, as well as odds, payoffs and much more. The archive also contains videos of Triple Crown races and Breeders’ Cup championships races etc. If you live in the United Kingdom you will undoubtedly be aware that Channel 4 has won the broadcasting rights for virtually every major race in the UK and Ireland. Channel 4 Racing now provides full coverage of The Derby, Cheltenham Festival, Royal Ascot and the English Grand National. This makes the 4OD app indispensable for any horse racing fan in the UK. 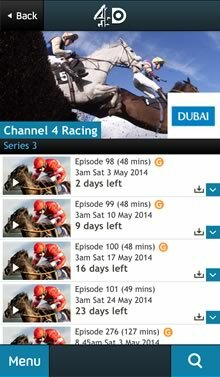 While the app does not offer live streaming, it does feature replays of every racing programme on Channel 4 for a month after their initial broadcast. You can also watch repeats of "The Morning Line" show, which provides betting tips and advice on the day's upcoming races. 4OD apps are available for Apple iOS, Windows Phone, Android and games consoles. If you live outside the United Kingdom, you'll need to use a VPN or SmartDNS service in order to access the video streams. 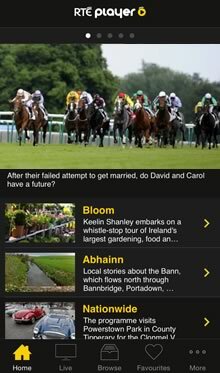 Channel 4 Racing also have a Channel 4 Racing iOS app featuring racing news, interviews, race cards, results and pictures. RTE are the state broadcaster of Ireland so it's only natural that they would broadcast race meeting and festivals from both Ireland and England. Major meeting covered include the Punchestown Festival, Curragh Irish Derby Festival, Galway Races, Leopardstown Christmas Festival and the Champion Stakes. Both live streams and replays are available on the RTE Player app. Some live broadcasts may not be available via the app due to broadcasting rights. RTE also run nightly highlights programs during major festival like Cheltenham, which can be viewed from the player for 21 days following broadcast. The RTE Player is available for free on iPhone, Android and iPad. Most shows can be watched from anywhere in the world. An Irish VPN or SmartDNS service may be required to watch live streams of certain race meeting, particularly those held in the UK. All account holders at TAB can watch a free live stream of Sky Racing 1 and Sky Racing 2 from their iPhone, iPad or Android device for 2 months. After the trial period users can opt for a either daily pass (AUS $5), a monthly Pass (AUS $20) or a yearly pass (AUS $150). For the first 2 months you just need to be an account holder. There is no requirement for you to place a bet in order to watch live horse racing on your phone. TAB customers can also access race replays or watch a whole range of horse racing programs, including Racing Round the World, In The Gig, The Catching Pen, John Tapp’s Inside Racing, The Punting Club, and Off The Beaten Track. Due to contractual restrictions on broadcasts of the Sky Racing channels, the stream is NOT available in the following countries: United Kingdom, New Zealand, United States, Canada, Mexico, Brazil, Hong Kong, Malaysia, Papua New Guinea, Sri Lanka, United Arab Emirates, South Africa, Singapore and France. Racing fans in Australia can now watch all Victorian and Sydney races, including the Melbourne Spring Racing Carnival and Sydney metropolitan races, on any iPhone, iPad or Android device. 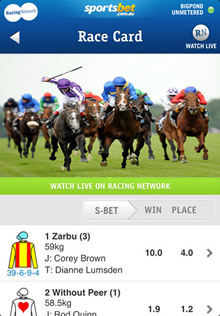 The RACING NETWORK OFFICIAL app features live races as well as race replays. To access the live streams users can either buy a one day pass for $10.49 or sign-up for a monthly recurring fee of $19.99. 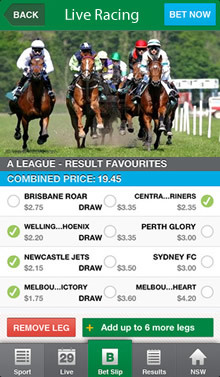 A free version is available for IPhone, iPad, iPod Touch and Android that offers a comprehensive form guide to every TAB listed race in Australia. The RACING NETWORK OFFICIAL App also provides up-to-the-minute race results, horse profiles, live race commentary plus best bet and tipping selections.